Nelson Books (Thomas Nelson), 2018. 236 pages. 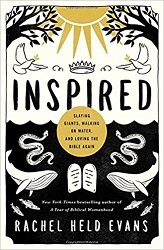 In this book, Rachel Held Evans takes a look at the Bible with love, affection, imagination, and scholarship. Inspiration is better than magic, for as any artist will tell you, true inspiration comes not to the lucky or the charmed but to the faithful — to the writer who shows up at her keyboard each morning, even when she’s far too tired, to the guitarist whose fingers bleed after hours of practice, to the dancer who must first learn the traditional steps before she can freestyle with integrity. Inspiration is not about some disembodied ethereal voice dictating words or notes to a catatonic host. It’s a collaborative process, a holy give-and-take, a partnership between Creator and creator. While Christians believe the Bible to be uniquely revelatory and authoritative to the faith, we have no reason to think its many authors were exempt from the mistakes, edits, rewrites, and dry spells of everyday creative work. Nor should we, as readers, expect every encounter with the text to leave us happily awestruck and enlightened. Inspiration, on both the giving and receiving end, takes practice and patience. It means showing up even when you don’t feel like it, even when it seems as if no one else is there. It means waiting for wind to stir. God is still breathing. The Bible is both inspired and inspiring. Our job is to ready the sails and gather the embers, to discuss and debate, and like the biblical character Jacob, to wrestle with the mystery until God gives us a blessing. If you’re curious, you will never leave the text without learning something new. If you’re persistent, you just might leave inspired. In this book she includes some Midrash-inspired fiction leading into chapters about different types of literature found in the Bible. I like the playfulness of those parts, but I especially liked the things she had to say about the different stories found in the Bible. She’s coming to the Bible with deep love and reverence – but acknowledging that this book was written by humans and we don’t have the original manuscripts, and our individual interpretations may or may not be correct. And that’s what it’s all about. Christians believe the Bible is inspired by God. But what does that mean? This book is central to our faith, and I do believe it has power. I was blessed by this closer look at its pages, at the stories found there. If I’ve learned anything from thirty-five years of doubt and belief, it’s that faith is not passive intellectual assent to a set of propositions. It’s a rough-and-tumble, no-holds-barred, all-night-long struggle, and sometimes you have to demand your blessing rather than wait around for it. The same is true for Scripture. With Scripture, we’ve not been invited to an academic fraternity; we’ve been invited to a wrestling match. We’ve been invited to a dynamic, centuries-long conversation with God and God’s people that has been unfolding since creation, one story at a time. If we’re lucky, it will leave us with a limp.